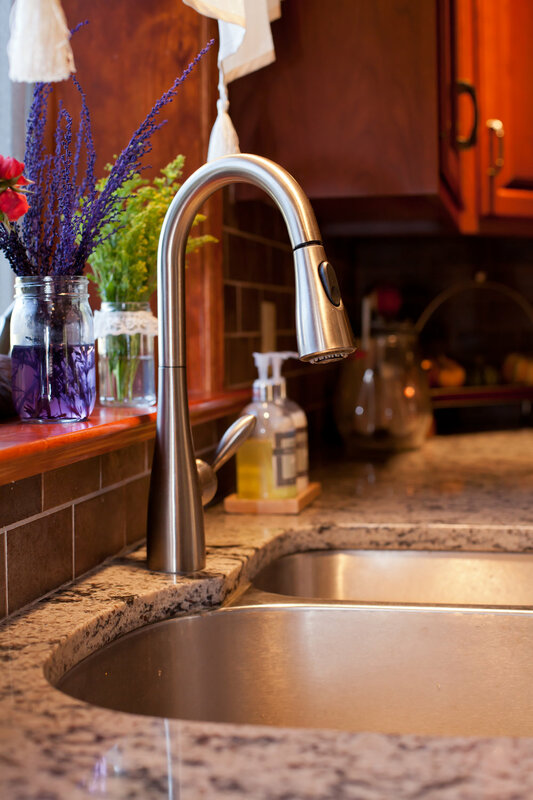 When I met this couple, this great kitchen was Mary Kay pink, on the North side of the home, dark, and cold. More of a pass through, this kitchen didn’t function for this family. By opening the wall between the dining room and kitchen we were able to expand the kitchen visually, if not physically. 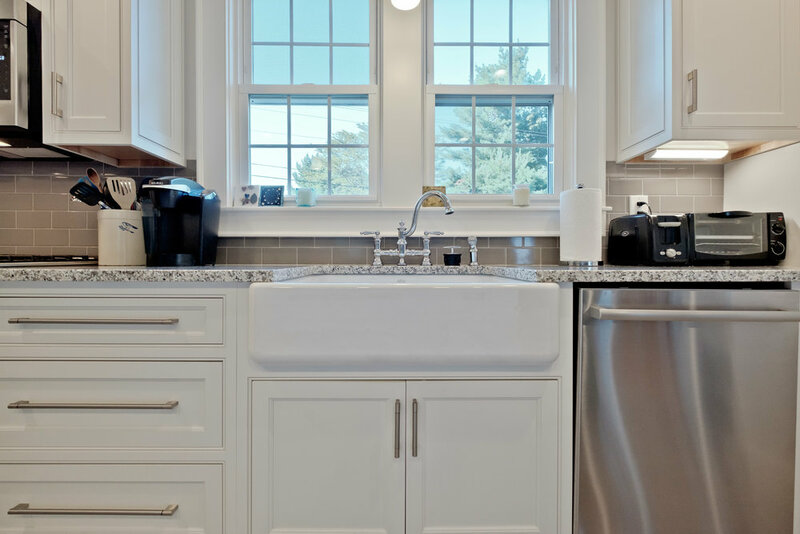 The south light from the other side of the home brightened this kitchen space along with the white cabinets and counters. A peninsula added more counter space to the old kitchen, but created a very narrow hallway and pass through of the kitchen. 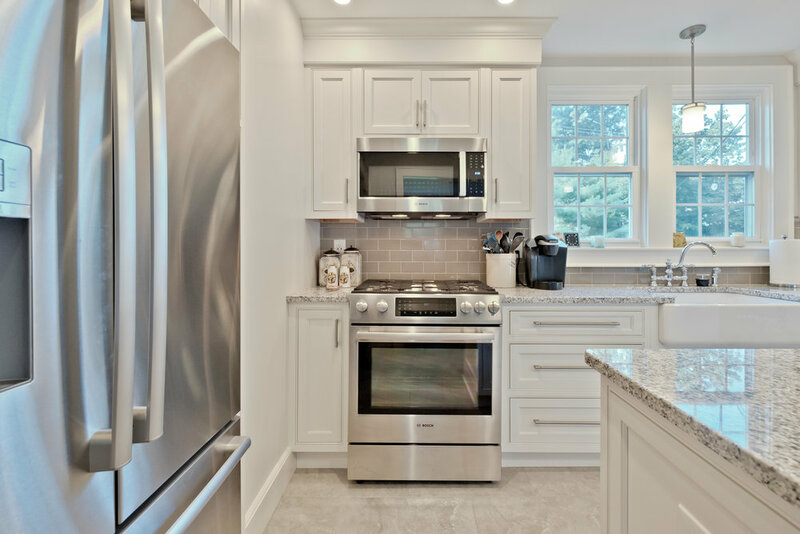 By eliminating the pass through and expending the pantry cabinets in the adjacent dining area we were able to create more space in this kitchen. Pushing the refrigerator into a recessed nook by claiming space from a closet behind allowed for a full island and flow through the kitchen. This home was once the greenhouse/gardeners cottage for a larger estate. 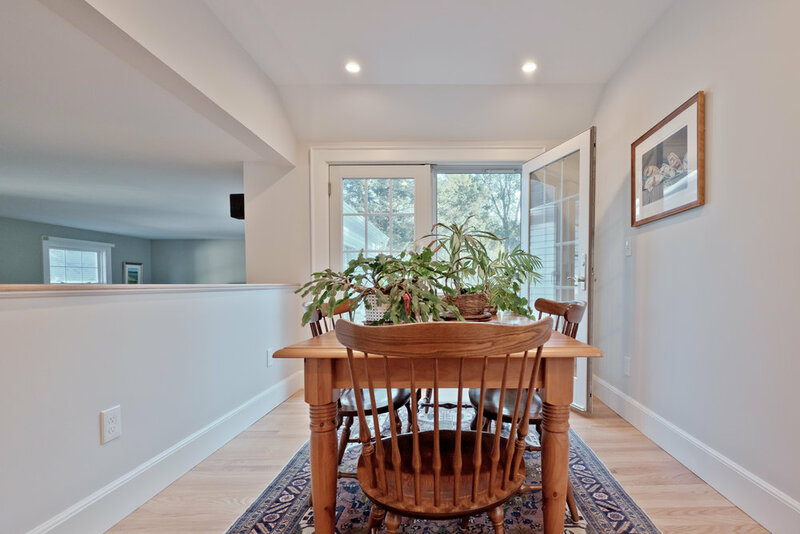 It boasts a wonderful sunken living room in what was once greenhouse, and the new stairs draw a line up from the front door all the way through the newly renovated kitchen. 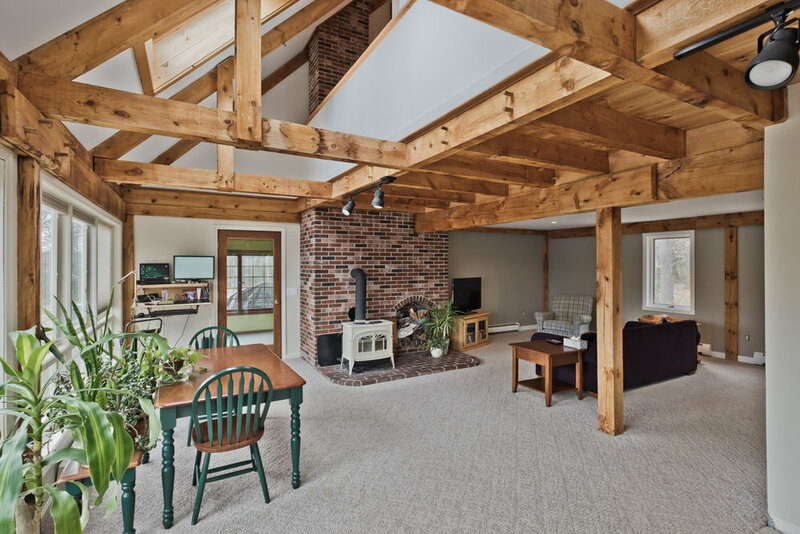 Sited perfectly to absorb the southern light, but dated in a different era, this timber frame home was built for efficiency. 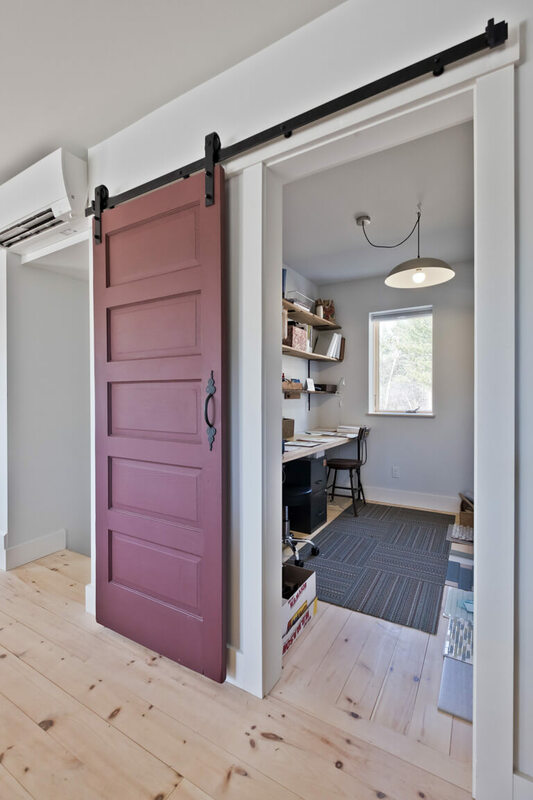 Removing the tongue and groove board ceiling and dense packing the roofline maximized the efficiency of the space while sheetrock brightened the interior rooms. The major portion of this renovation was 2 bathrooms. In the first floor bath we added a shower creating a full bath on that level. 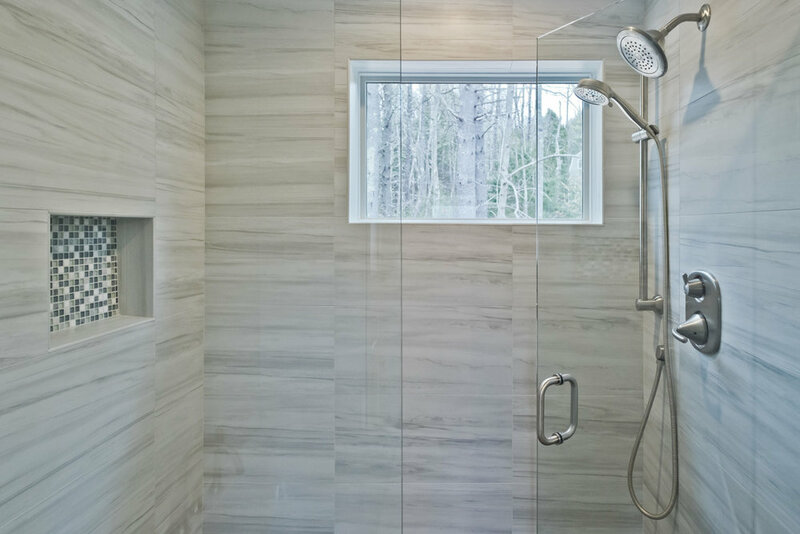 In the 2nd floor bath we maximized the space by adding a rear dormer and creating the headroom necessary for a bathroom. 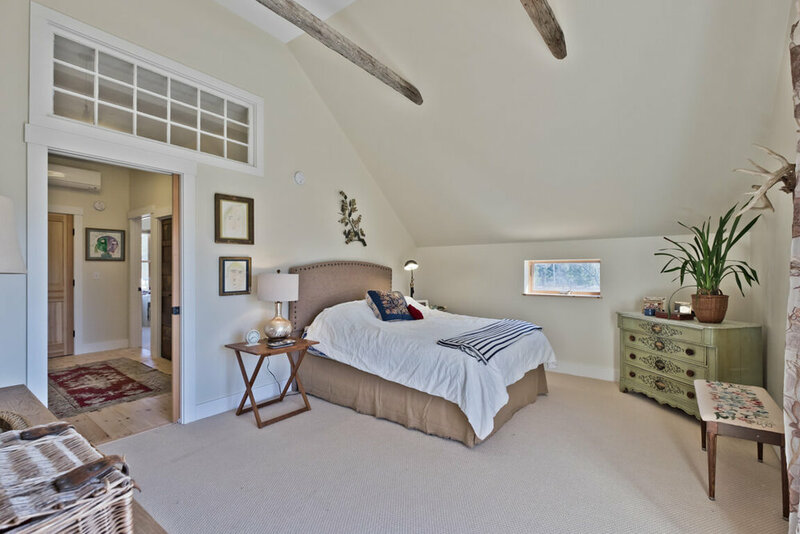 The bonus was additional walk in closet space created by the new dormer. 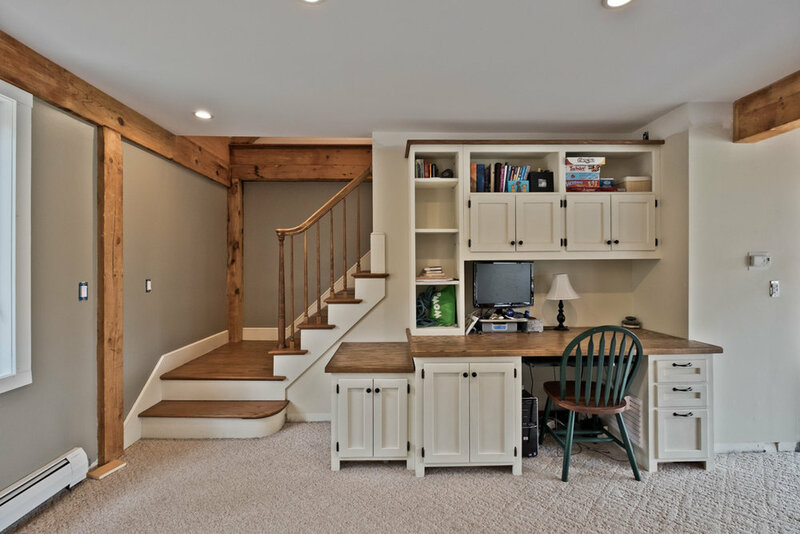 The craftsman at East Shore Builders created these custom built in shelving units into the eave which better defines the room and uses unusable space for a great purpose. 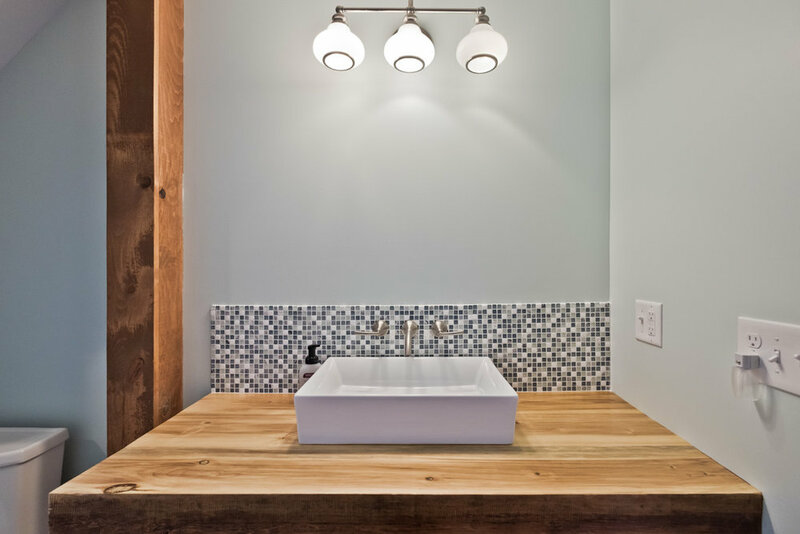 They also hand crafted the open concept sink in the upstairs bathroom with unused timbers that were stored in the basement from when the home was built. 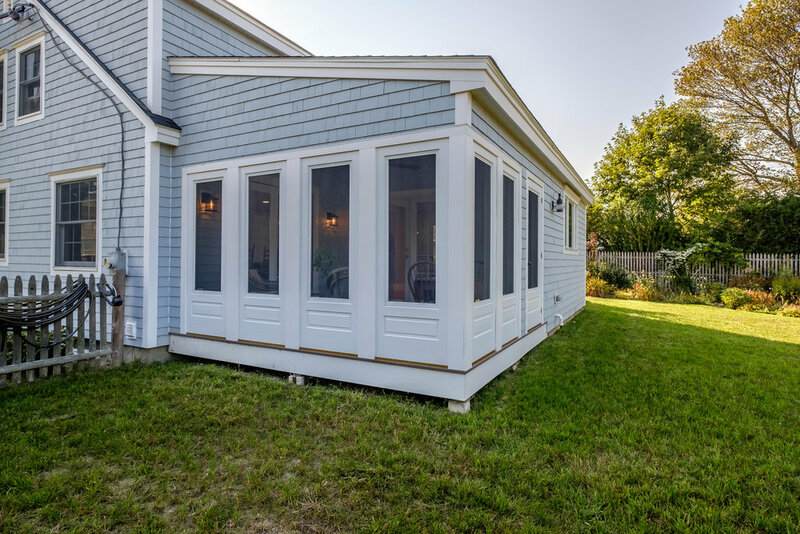 A new kitchen and sunroom addition was created to improve the flow and floorplan of this cute little cape in Falmouth Maine. 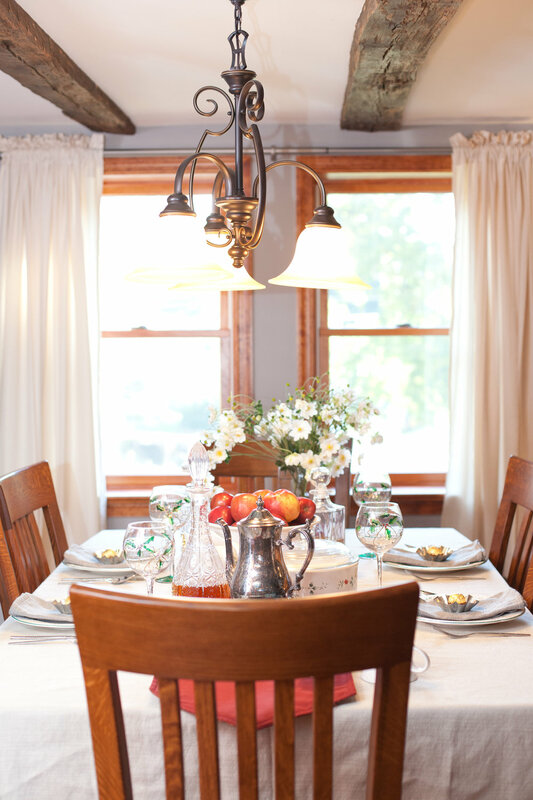 As their family grew and changed, they needed more space to congregate and a larger dining room to fit everyone. They also had a wonderful deck that was in need of replacement, but they found they didn’t spend much time there because it had no shade or way to get away from the bugs. A little shed roof addition was added to the rear of the home. Not visiable from the street, the new private location allows for 3 seasons of enjoyment in the screened in porch by using door panels with removable storm windows. 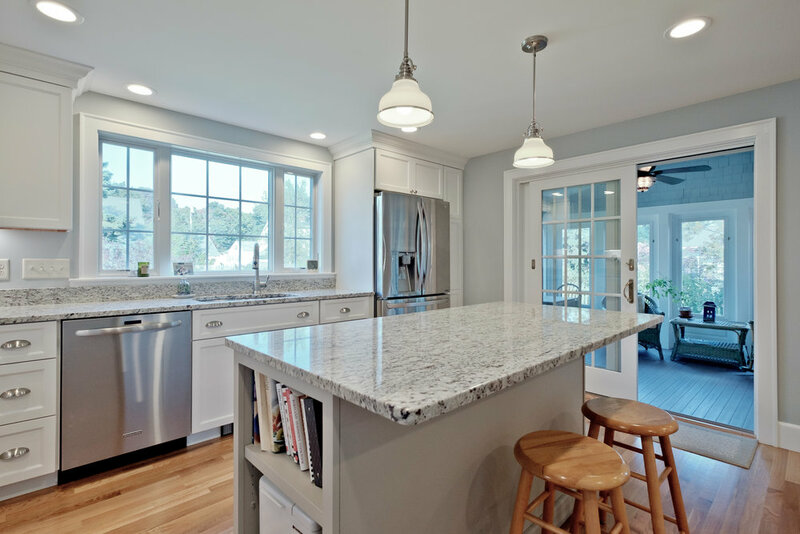 The updated and bright kitchen added extra seating at the island, flow through the main house without having to go through the kitchen, and a longer dining room to expand when the whole family is home. 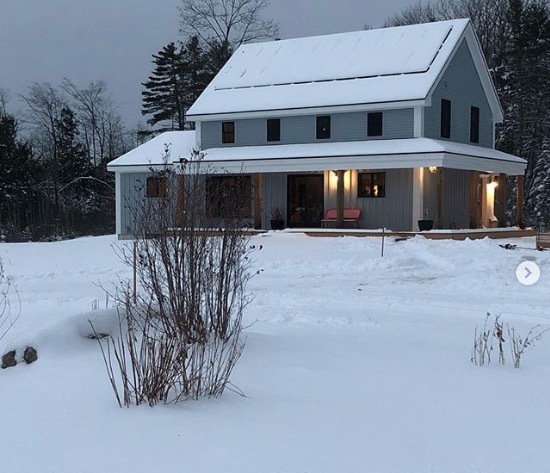 This 3 Bedroom, 1 1/2 bath farmhouse was built prior to the Civil War with square sawn logs, a natural spring in the basement, and many renovations over the years. 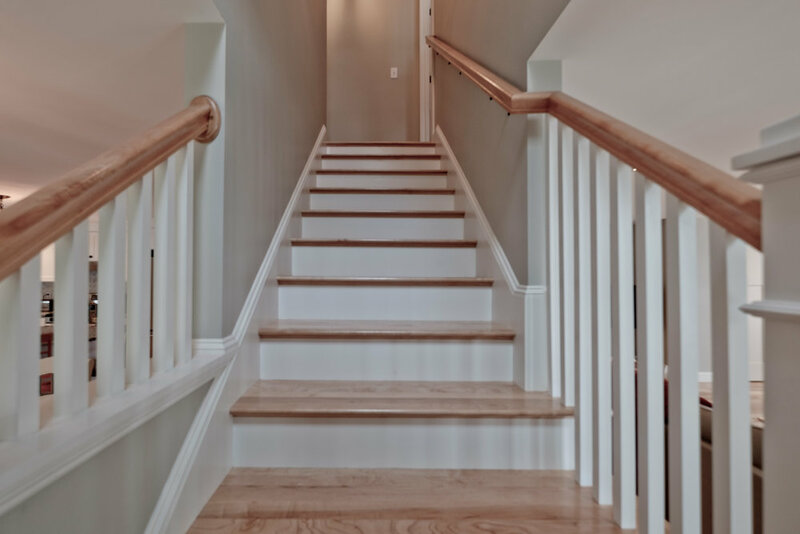 What started as a small renovation to correct a floor sagging issue, became a complete renovation for this home. The walls were furred out to add air sealing and insulation. Plaster was removed and timber framing was exposed and highlighted. 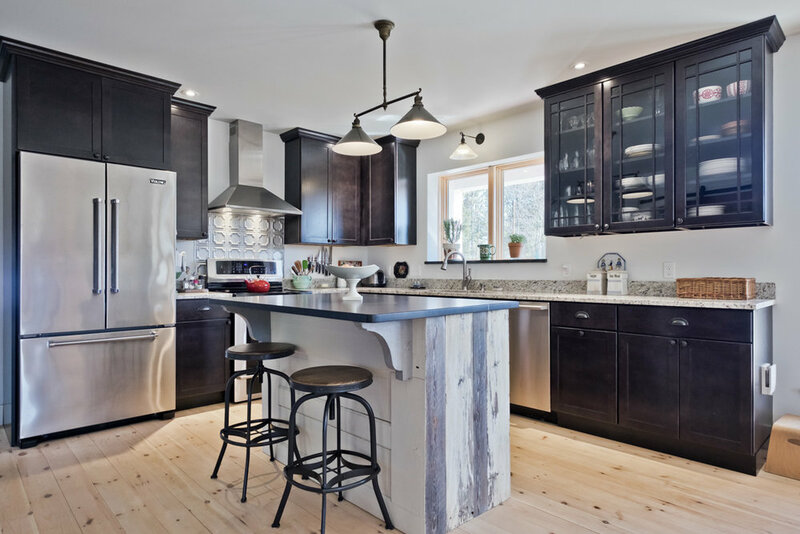 The bedroom and kitchen swapped locations to create an open concept living area for their growing family needs. Moving the first floor bedroom allowed for better placement adjacent to the bathroom and for a full size stair to access the 2nd floor where previously furniture was changed by removing a 2nd story window. Properties located within 250 feet of any body of water in Maine are subject to town and DEP rules. This little lake house was no exception. Located within 100 feet of the lake, this home had a maximum expansion of 30% of the home that existed on January of 1989. With just enough square footage, we were able to take a single story rear addition up to a full 2nd story and take this lake-house from 2 small bedrooms and 2 small baths to 3 bedrooms and 2 ½ bath home. This home now boasts an open concept first floor plan which maximizes the view from every room. 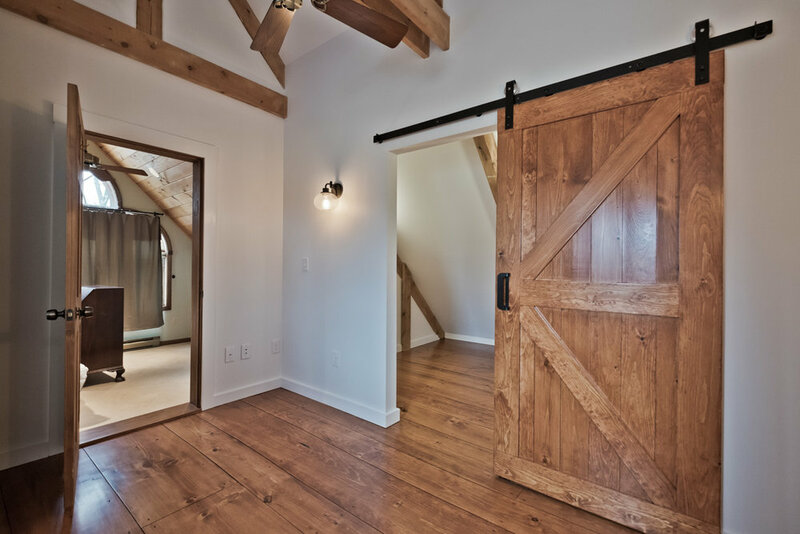 Planning for retirement, it was this clients dream to live in a barn-style home. 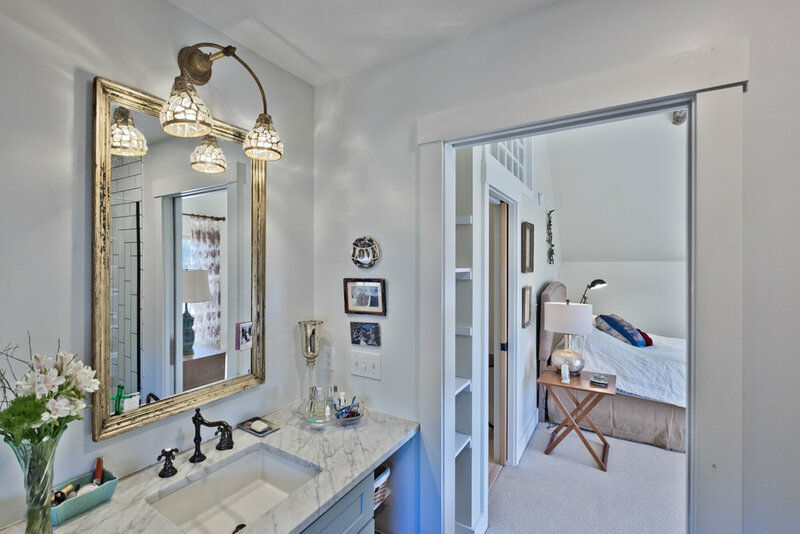 Downsizing after raising 4 children, they were looking to create a warm and inviting family space for gathering, small bedrooms for guests, and a first floor master suite for aging in place. 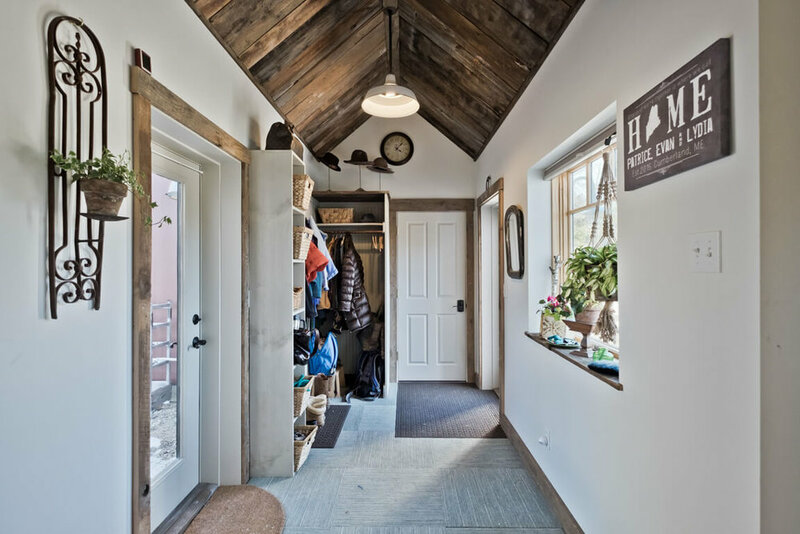 This 4 bedroom, 2 ½ bath home looks like a barn from the outside, but feels like a cozy cottage on the inside. 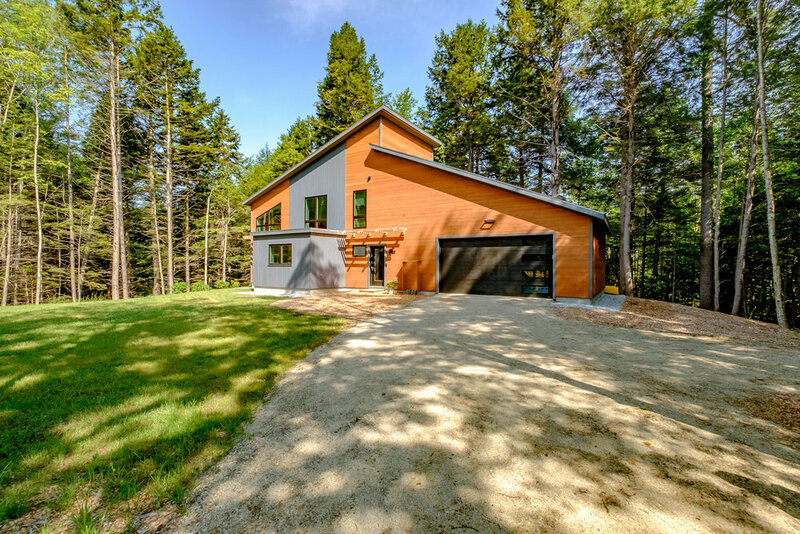 The exterior timber porch and living room windows look out over a meadow while the circular driveway allows for plenty of car parking during gatherings as their family grows.